The Mary Sue (who I've written a few things for) recently published an article by Jarrah Hodge and, basically, I ended up with a new (imagined) BFF. This chick (with some help) put every live action episode of Trek to the Bechdel Test (#1- Two named female characters. #2- They talk. #3-They talk about something other than men.) and reported her findings. Were they super surprising? Not really. Though, Enterprise really let me down. I love that show and, while I feel that Hoshi and T'Pol both had strong character arcs, it's still disappointing that the ship's Science Officer and Communications Officer had so few (man-less) conversations. My main issue with Enterprise has always been in their missed opportunity to showcase an LGBT character (and you're welcome to read all about that in my love letter to the best Trek romance that never was: Reed and Hayes) but this is also troublesome. 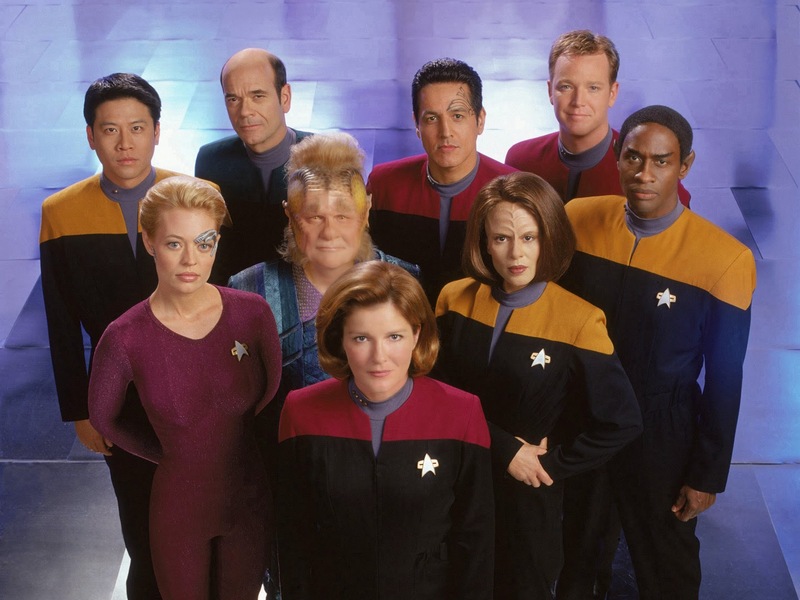 The series that fared better than any other was Voyager. I considered putting a little "of course" in that sentence but, in thinking about this test as applied to Trek, that seems a little counter productive. I've read a lot of fans talking about these results and that seems to be the general attitude. "Of course Voyager passed, it was female centric/heavy/focused/dominated." But... it's not. Not really. #1- They all pass the Bechdel Test. Easily. #2- Each of their stories are driven primarily by a female character (Night: Janeway, Drone: Seven, Extreme Risk: B'Elana) This is a bit of a coincidence. The next episode in the line-up is a Chakota-sode. Still, I think it's a point worth mentioning--especially since the season premier focuses heavily on a female character. #3- There are three women in this show. I'll be honest, I picked this look because I'm way into Janeway's sassy bob. So here are nine people. 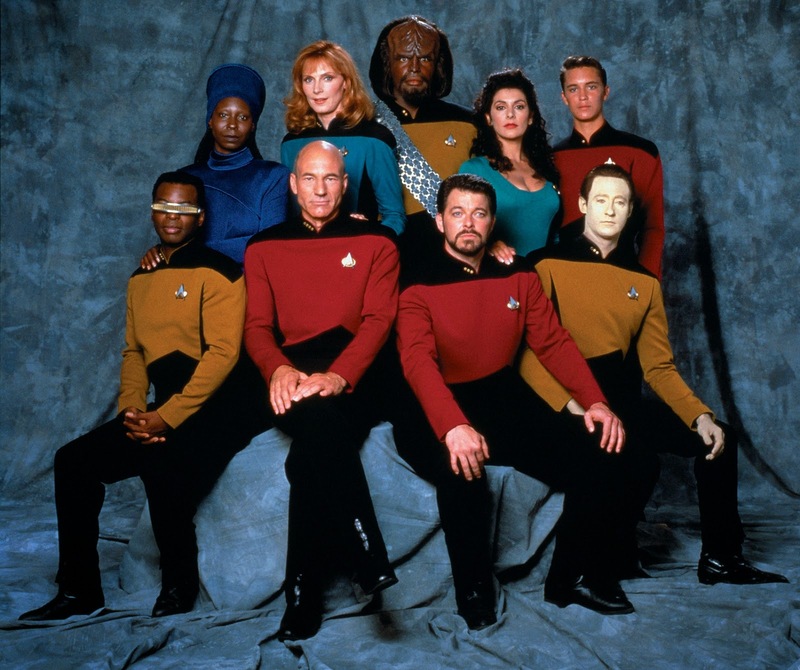 TNG, DS9, and Voyager all had nine-member casts. It's apparently something everyone in development thought was super important from about 1987-1995. 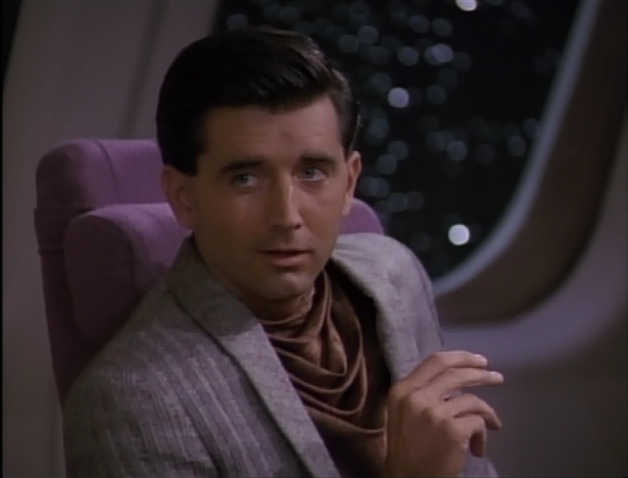 It's good to see Sears Portrait Studio of the 23rd century is still upholding this kind of quality. I don't know, I couldn't think of a joke for this one. Alright, in TNG you have two regular, female cast members and with an optional third in Tasha/Guinan. DS9 is about the same because you get a rotating cast of female regulars in Kai Wyn, Keiko, Leeta, Kasidy and Ziyal. Anyway, you don't have to have a fancy Starfleet degree in mathematics to figure out that 2-3 out of 9 isn't a majority. It's not even half. You could say, "Well, the Voyager women are more important in terms of ship's operations." Well, that's true in the case of the Captain, I suppose, and maybe that's the key. Because I don't think that Kira or Dax are less important than Torres or Seven. And the ship's engineer and astrometrics specialist are no more essential than the ship's doctor and counselor (though I would make an argument about Troi's character before/after her Starfleet Uniform) so why is it that Voyager is so far ahead of the other series in terms set forth by the Bechdel Test? #1- Is it the female captain that makes all the difference? #2- Is it the actors? #3- Is it a more specific treatment of the show's female characters in an episode-by-episode and long-term character arc breakdown? #4- Is it that Voyager was just the most recent after two prior re-envisioning of Star Trek and the writers knew they needed to do something different but then fell off the wagon when it came to Enterprise? #5- Did Voyager come along at a time when it could be influenced by other pop-culture? Something about the zeitgeist? I have a few theories but I'm going to explore them in blog posts to come because this is an issue that really interests me. Star Trek is a show that has (obviously) been a huge part of my life and I like thinking about why and how it affects me, and what lessons I can take from it as a human, a woman, and as a writer. So, because I'd like to talk about each of these ideas and don't want to make your eyeballs bleed by putting it all right here, I plan on, over the next few days, writing about my further explorations in the Trek Bechdel Test. 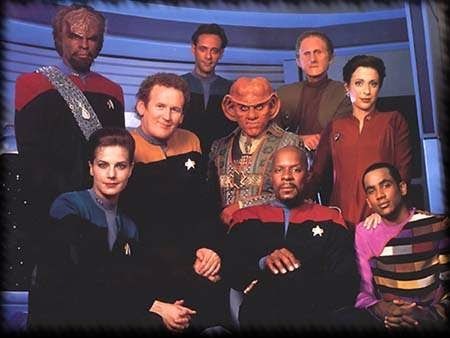 I'm going to watch a few more episodes (probably the same SSN/Eps from DS9 and TNG and some later eps from TOS and ENT) and I'll get back to you. Especially about #3, which is something I've been wanting to write about for a while. Would you like a hint about its subject? Here's my gift to you. I feel like a benevolent parent letting their child shake their Christmas presents. It's not a train set. Sorry. A Note About The Bechdel Test: I fully realize the Bechdel test isn't a perfect measure of a show's ability to represent strong, female characters but it is telling. And it does present us with a way to observe and analyze the shows/movies we love in a quantifiable way--which can then lead to a dialogue about the treatment of female characters. I read Hodge's piece the other day, and all I kept thinking was, "I want to hear AshleyRose's analysis of this!" So glad you're delving in- I can't wait to read your further exploration of this topic. That's awesome KJ! I'm honored. And it's good to hear from you again! And I'm taking my second swing through Voyager, loving every bit of it. Once I'm done with Stats and can get back to daytime painting, I'm starting ST! For, like, the first time ever.